As a part of a greater project we now have the brackets from every state tournament from 1985 until 2018. Please feel free to peruse these great brackets and point out any errors in names or spellings or results...or to praise me for the great work. The best way to view is use the sort and go by year. In the future it will be MUCH easier to navigate. I am hoping to add the other years soon. The others I need to check the brackets when I get home. Those are all fixed now, thanks! Just a note the 1984 brackets are not correct. There is some issues with the logic since there was a pull through wrestle-back that was...fun to say the least. 140 in 1996 takes me to an error page every time. Great resource and fun to look back at the brackets from the 1980s - thanks Joe! 1984 145 lbs... David Locke of Delta listed twice. As previously stated, the 1984 brackets have some issues. 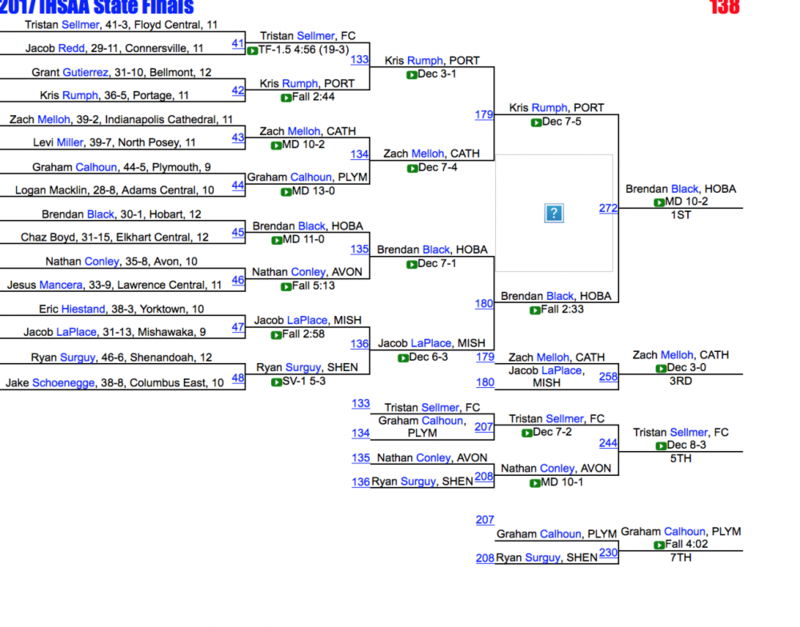 I want to say great work on the past brackets, they are greatly appreciated in the wrestling community. Is the information out there for Top 10 Team scores by year as well? Is there any way to see the 1990 championship matches? Are they archived anywhere? First off thanks for putting this together. (not complaining) but 2017 match ups and scores are wrong. only looked at 138, but Brendan black won 11-0 round 1, 7-1 round 2, Fall 2:33 round 3, 10-2 round 4. also faced names---Chaz Boyd, Nathan Conley, Jacob laPlace, and Kris Rumph. Thanks, it looks like many of the 2017 first round matches are not correct. 1993 112 pound class is incorrect. Wrong winner in 7-8 placement. 2017 brackets are fixed, had an issue with my converter. Hopefully the other years aren't messed up. Thanks, looks like all the 7th place match result details are the same as the 5th place.